Week two saw the debut of the majority of the rest of the teams, and the meet didn’t disappoint. Catch up on everything you missed, check out our week two superlatives and more! Freshman Gobourne’s 9.950 floor routine in her home debut was spectacular and a key part of the Tigers’ stunning upset of LSU. Her tumbling is great and her performance quality will get Auburn fans on their feet for the next four years. We knew Ohashi was going 10.0 on floor as soon as she stuck her brand new split leg double layout first pass. One judge gave Edney a 10.0 on bars, but her routine has built-in deductions such as flexed feet and bent-arm casts that should prevent a perfect mark. Week one was a little rocky in the Big Ten, but both the Spartans and the Illini picked up the pieces this weekend to improve by 3.200 and 2.325 points, respectively. Towson freshman Emerson Hurst made a statement in her first college meet, tallying a 9.875 on beam to win the event. The Big Storyline: Oklahoma’s vault lineup consisted entirely of 10.0 start values, which will be sure to make it even more competitive against other top teams (if that’s even possible at this point). Georgia also had a great vault rotation after opening the meet with two falls on bars; vault was the only lineup in which the Gymdogs didn’t count a score lower than 9.800. Records: Oklahoma now holds the longest record of consecutive 196-plus scoring meets, not having gone lower for 107 straight-competitions. OU senior Nicole Lehrmann earned a career high score of 9.950 on that event, and classmate Alex Marks set a personal best on bars with a 9.875. Junior Jade Degouveia also earned a career high score of 9.850 on floor. 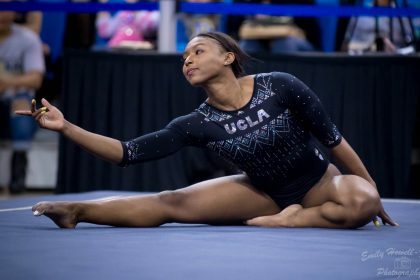 The Big Storyline: UCLA soared after a mediocre start on vault, closing the meet with a season high and an imperious 49.700 on floor. Margzetta Frazier made her debut on vault and floor while Norah Flatley competed all around for the first time. Michigan State improved spectacularly from its first competition, scoring over three points higher than week one. Implications: The Bruins proved that they can contend at the top despite injuries, scoring only about a tenth lower than No. 1 Oklahoma this week. 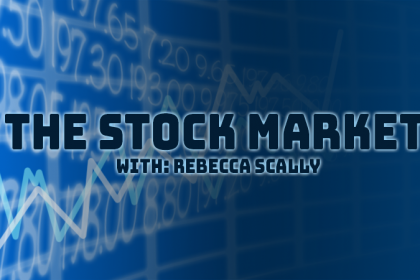 Cal will drop out of the top 10 in week two but showed signs of rounding into form. Records: Kyla Ross tied her career high with a 39.700 in the all around. MSU’s Ella Douglas set a new career high of 9.800 on vault. Controversies: Grace Glenn was in a boot after a rough landing on bars last week at home, but it’s only precautionary. Felicia Hano was out for the week with a sprained ankle. UC Davis temporarily seemed to count a lower score on floor after a scratch was accidentally counted as a zero and the intended anchor was judged as an exhibition. The last score, a 9.700 from Kelley Hebert, was eventually added into the final total hours after the end of the meet. The scratch, Kyla Kessler, was wearing a boot last week at the NorCal Classic and lingering ankle trouble is likely why she was out. The Big Storyline: The Utes reigned supreme in this college rivalry. The Cougars put the pressure on, including tallying a 49.325 on beam to prevent the Utes from expanding their lead, but their efforts ultimately weren’t enough to come out on top. BYU senior Shannon Evans also delighted with her new floor routine set to Super Mario music. Implications: BYU is now ranked sixth overall and first in the MRGC. Utah moves down one spot to No. 4 overall and retains its second place ranking in the Pac-12. Records: Utah hit 197 in the first two weeks for the first time in program history. Ute junior Mykayla Skinner also set a school record by hitting her 118th routine in a row without a fall. BYU recorded its highest season opening score in program history. The Big Storyline: Auburn was stone cold at home to upset a shaky LSU—and it still has room for improvement this year. The Tigers cruised, especially on bars where they had four scores of 9.900 or higher and a team total of 49.500. LSU had a rocky meet from the start with some form in the top half of the bar rotation and some hops on vault; but when McKenna Kelley was pulled from floor, nerves seemed to get to the team, and a series of odd landing errors gave Auburn a lead that LSU ultimately couldn’t recover. Implications: Auburn was able to jump to No. 12 in the country with its strong score. LSU took its first regular season in-conference loss since 2016. 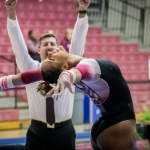 Records: Freshman Derrian Gobourne won the all around in her debut. Her 9.950 on floor was Auburn’s highest individual score since 2015. Controversies: LSU’s McKenna Kelley took an odd landing on floor in touch warm up and was replaced by Bailey Ferrer in the lineup. Kelley’s status is unknown. The Big Storyline: Denver upset both Alabama and Michigan to take the title. 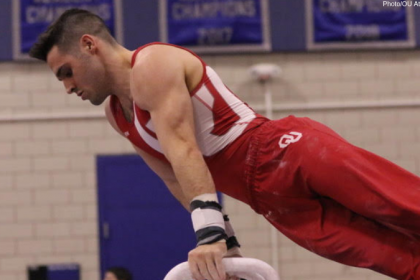 The meet was fairly tight between the top three throughout the meet, but in the end the Pioneers sealed the deal with their highest event total of the night on bars. Alabama again had a shaky beam rotation and Michigan improved on its performance last week by hitting 24-for-24 despite tallying a similar final score. Implications: Alabama will be happy to have a score in the 196s to average with its lackluster first week performance. This should result in the Tide moving up in the rankings at least a little bit. Michigan won’t see much change in its average, yet dropped to No. 9 due mainly to new teams entering the rankings. Denver put up a solid first week score and ends the week ranked at No. 8. Bowling Green will likely end up near the bottom of the MAC and low in the standings after a meet to forget. Records: This is Denver’s first win over Alabama in program history and just its third ever win over Michigan—the last time it beat the Wolverines was 2007. Its 196.275 is also the second-highest opening score in program history. Freshmen Alexis Vasquez, Alexandria Ruiz, Tess Muir, Paige Bachner, Katelyn Goldstrom and Anna-Maria Kanyai made their collegiate debuts. The Big Storyline: Almost all of these teams could have pulled out the win today, and it turned out to be one of the most competitive meets of the weekend. Oregon State squeaked out a W by the end with sophomore Kaitlyn Yanish assisting the team with the first all around performance of her career. Implications: Illinois will be far happier with its performance this week than its season opener, and it should expect to do relatively well among Big Ten teams this week. Kentucky, however, put up a team score a little under a point below last week’s mark, which won’t stand well in the SEC thus far. Records: Lindenwood recorded its second best season-opening score in program history. Sophomore Lion Courtney Mitchell’s all around score of 38.850 was the best of her career. In addition, Illinois sophomore Kylie Noonan recorded a career high score on floor with her 9.900, which was good enough to win the event. Controversies: Oregon State freshman Madi Dagen scored a 9.825 on beam, but the judges had two very different takes with one awarding her a 9.750 and the other giving a 9.900. There were also an unusual amount of score changes on floor. The Big Storyline: Couldn’t even tell you! It’s hard to find a storyline when we only see half the meet! For Nebraska, it was what the Huskers do without Megan Schweihofer, who only competed beam. This meant shuffled around lineups and a freshman-heavy outing. Things went fairly well, but they’ll want Schweihofer back sooner rather than later, especially at away meets to get those important away scores for RQS season. Implications: We had no idea what to expect from this Washington team that has been plagued with injuries, but the Huskies showed up and put up a strong performance. A 195 first meet away is a solid start. Nebraska trails behind some Big Ten opponents, like Michigan and Ohio State, which each put up 196 away scores this weekend. Records: Sierra Hassel’s 9.900 on beam for Nebraska was a career-high. Controversies: What wasn’t a controversy at this meet? First, we need to never do a gym/wrestling combo stream ever again ever. We don’t want to hear Washington floor music and know Kristyn Hoffa is making her return from injury while we’re watching dudes lie on a mat. Sorry, no. Second, we’ve seen rumblings that scoring was too tight; it was strict, but not atrociously so. It was in line with usual Big Ten scoring, and we understood the scores we saw. We wish all scoring was this way, to be frank. Third, WE DIDN’T GET ANY WASHINGTON on the stream in a meet that was tied after both the first and second rotations. Come on. Emily M might just have to fly to Lincoln next year to avoid this catastrophe repeating itself. The Big Storyline: The Arkansas freshmen made big contributions for the Razorbacks on vault tonight. Kennedy Hambrick posted a winning score on the event, and Amanda Elswick also debuted in the lineup (though not with her 10.0 start value yet). Hambrick also contributed counting scores on beam and floor. Implications: Arkansas improved its performance from last week, which will be good to keep it in the mid-to-upper tier of SEC teams. Arizona didn’t record a score over 9.875, but its team score was only a fraction lower than last week’s, so its Pac-12 standings likely won’t change much. Records: Arkansas earned its first win in a road dual meet since early 2017. Arizona senior Danielle Spencer-Bearham earned a career high score of 9.800 on floor. The Big Storyline: Florida scored its highest season-opening total ever, showing its season progress even more than in recent years. However, Missouri was right on pace with the Gators for most of the meet, which is something the Tigers should be just as proud of. They posted a team score that was a full point higher than last week’s. Implications: Missouri will expect to climb in the standings, and Florida’s team score was good enough for second best in the country among season-opening scores. Thus, the Gators should crack the top five handily. Records: Florida’s 49.500 score on bars was the highest season-opening bars score of 2019. Gators Alicia Boren and Nya Reed scored 9.925s on floor to win the event and tie the program record for best season-opening floor scores. Controversies: Some fans had issue with the fact that Florida freshman Trinity Thomas had the lowest beam score out of the rotation (9.850). The Big Storyline: The NorCal pair more-or-less lived up to the expectations they set last week with Sacramento State almost exactly equaling its score from that meet and Stanford dropping slightly after Kyla Bryant put in a just-human performance instead of the cyborg kind from week one. Seattle Pacific was also as-expected in week one, with several key freshmen missing but helped by a great performance by junior Darian Burns. Implications: Stanford and Sacramento State weren’t able to keep up with the influx of new teams competing this week, dropping to No. 24 and No. 62 respectively in live rankings. Controversies: Sacramento State once again had a challenging time on bars, forced to count a 8.150. The live scores reported its score as a 190.000 at the end of the meet; we’re not sure which score was lowered before certification. The Big Storyline: Arizona State improved upon its week one score by over half a point while TWU bested its season-opening total by almost a point. Both teams looked right on track for this point in the year. But the most important part of the night came with the leotards, Texas Woman’s in particular. The Pioneers wore crushed red velvet in honor of alumni night, a tradition the team has been participating in for a number of years now. Implications: TWU showed signs of improvement already for a team and division that typically starts the season slow before really ramping up in time for USAGs. ASU also put up a solid number that will keep it in the mid-tier of the Pac-12. Controversies: TWU’s Morgan Colee had a scary fall on her bar dismount. However, she walked away on her own power and was check out extensively by the athletic trainer before being cleared. She was not slated to compete any events after bars. The Big Storyline: Cleanliness. Both teams in this meet had some small landing errors, but overall both sides of the competition looked tidier than we might expect in January. That’s an excellent sign for two teams hoping to break into the top tier of NCAA competition. Implications: Ohio State’s away score here bested Nebraska’s 195.550 at home; for now, the Buckeyes are one of only three Big Ten squads to hit 196. Is Ohio State going to join Nebraska and Michigan at the top of the conference pack? So far, it looks that way. For the Wolfpack, this near-195 managed to hold off all but one EAGL team in Pittsburgh. Can they stay on top? Records: For Ohio State, Jenna Swartzentruber’s 9.775 on vault was a career high mark, and Morgan Lowe and Olivia Aepli put up career bests on beam with a 9.850 and 9.825, respectively. Controversies: There was a lot of concern on the part of the stream commentary that Ohio State was getting big floor scores without big tumbling. We’d argue the Buckeyes do have some big tumbling, like Jamie Stone’s two and a half to punch front, but that aside, they get big scores because they are precise with things like leap landings and have great performance quality. Sure, there are no full-ins, but the floor squad is extremely pleasing to watch. And isn’t that what it’s all about? The Big Storyline: Gianna Plaksa had an excellent meet. She has always been a standout for Central Michigan, but she is stepping into a big leadership role this year, winning bars, a share of floor and the all around against Illinois State. Implications: CMU’s 195 is a statement. As a team that lost many big names after last season, there were questions as to who would fill lineups. The younger members of the squad are falling in nicely behind Plaksa, and the Chippewas look strong. Controversies: We’re not sure it’s a controversy, but who would have predicted that Denelle Pedrick, who threw an Amanar during preseason, would become a beam and bar specialist?! Not us, that’s for sure. The Big Storyline: Towson freshman Emerson Hurst won the beam title in her NCAA debut with a 9.875. Implications: Penn State bounced back from a rough floor showing in Utah to break 49 this week and now sits in fifth place in the Big Ten. Temple also increased its score from last week and now sits in second place in the ECAC. Towson sits in sixth place in the EAGL. Records: Temple sophomore Monica Servido posted career bests of 9.825 on beam and 9.800 on floor, and freshman Ariana Castrence scored a 39.150 in the all around, which is just 0.05 lower than Temple’s program record. Look for Castrence to possibly break this record in the coming weeks. The Big Storyline: Look at these WIAC teams! It was a thoroughly close contest, and a great preview of WIAC competition this year. Implications: Minnesota reminded us that it is a Big Ten team that can qualify to the conference championship night session, landing above teams like Illinois and Maryland this weekend. Records: Gustavus’ 182.175 is its highest season opening score in program history. Controversies: Scores, of course! There is a lot of speculation that if gymnasts like Ivy Lu and Lexy Ramler competed for a big-name team, they’d have racked up some 10.0s by now. The Big Storyline: UIC was a force in this meet. It started out a little slowly on vault and bars, but very strong beam and floor rotations propelled the Flames over the 194 mark. Implications: After a similar performance this week, UIC is joining the MIC title conversation. It was a rough start for Kent State, and the Flashes will lag behind the rest of the MAC conference for now. Records: UIC’s Kayla Baddeley set career highs on beam (9.850) and floor (9.800); Ashley Albrecht tied her teammate’s floor score and also set a career-high mark. Controversies: The judging in this meet was incredibly slow. There was one point when teams were waiting on scores for several minutes on all four events, so absolutely nothing was happening. The Big Storyline: Although this meet was close after one rotation, the Broncos pulled away from the the Spartans and Falcons as the meet progressed, highlighted by their bars and beam rotations. Air Force sophomore Tyler Davis returned to the lineup after being largely MIA at the team’s December intrasquad. In injury news, San Jose State’s Ellie Pascoe-Long did not finish her floor routine and was later seen on crutches. Implications: Boise State’s 196.400 ranks it No. 6 overall and slots it just behind BYU in second place in the MRGC. San Jose State drops 20 spots to No. 47 and remains second in the MPSF. This was Air Force’s first meet, and the score will put it in third place in the MRGC and No. 52 overall. Records: Boise State co-head coaches Tina Bird and Neil Resnick registered their 200th career win. Bronco senior Shani Remme set a career high on beam with her 9.950, and her 39.500 score in the all around is the highest in a season opener in school history. Spartan Taylor Chan set a career high 39.175 in the all around. Controversies: Boise State’s live scoring was down for the entire meet. The Big Storyline: Iowa’s big freshman class delivered in this meet, putting up 11 routines with two misses and two event titles. Iowa improved over last week and has the building blocks for a solid season. Implications: SEMO’s struggles here led to the lowest score in all of collegiate gymnastics so far. It needs to push toward a 190, or it may finish last in the MIC in Ashley Lawson’s first season as head coach. Records: Erin Castle of Iowa posted a career-high 9.775 on floor. Controversies: We’re not sure whether it was just an error on SEMO’s part or if there was a judging review, but the final score the team initially tweeted was a 181. If it was a judging error, that would add to an already large pile of reviewed scores this year. The Big Storyline: New Hampshire bounced back from a rough floor showing at Southern Utah earlier in the week but struggled on both bars and beam, counting a fall on each. Implications: Iowa was not able to continue its momentum from its home opener, scoring back in the 193s as it did at Auburn. Neither one of these two road scores can be allowed to count towards Iowa’s RQS if it wants to make a run at regionals this year. Records: Several Iowa freshmen bested their scores from the previous two meets. Alexandra Greenwald scored a 9.725 on floor, and both Allie Gilchrist and Bridget Killian both scored a 9.825 on beam. The Big Storyline: Rutgers bounced back from a rough outing in Cancun scoring 3.375 points higher this weekend. Implications: Yale’s score puts it in first place in the ECAC conference. Records: Yale and Southern Connecticut both set program records for the highest opening meet score. Southern Connecticut senior Tiffany Coleman set a career high on vault with a 9.700. The Big Storyline: Alaska picked up another season high on the strength of a great performance from Sophia Hyderally. Implications: Alaska stays firmly in the middle of the MPSF and stays ahead of eight Division I teams in national rankings. Records: The Seawolves’ 192.400 is a program record for team totals in January. Hyderally’s 9.850 on beam ties for fourth in program history. Controversies: Brown had a very challenging beam rotation with a string of falls and a total of 45.875. The Big Storyline: Brown made up some ground while Alaska gave points away, but ultimately the Seawolves came out on top once again thanks to steady performances by Kennedy Green and Mackenzie Miller, as well as three-event star Sophia Hyderally. Brown showed a lot of potential, especially on bars where freshman Mei Li Costa shone, but its floor landings betrayed it. Implications: Alaska is ranked above eight Division I teams in the week two rankings—a serious accomplishment after finishing as the last DI team in 2018. Records: Sophia Hyderally beat her career high on floor with a 9.850. Controversies: Kaylin Mancari’s floor score was bumped 0.15 between the end of the meet and the scores being certified. The Big Storyline: George Washington felt the loss of its stellar 2018 senior class, only scoring 193.525 and falling to EAGL rival North Carolina. Implications: Most of George Washington’s routines are from gymnasts who have never been in the lineup before, so these routines will need to become more consistent as the season goes on if George Washington wants to maintain the same place in the rankings it had over the last several seasons. Records: Two of the floor winners, Cydney Crasa and Madison Hargrave tied personal bests on the event with a 9.875. North Carolina graduate student Megan Ruzicka made her college debut on vault, bars and floor after not competing gymnastics for several years. The Big Storyline: Penn had an impressive showing on beam for its first meet, scoring a 48.500, which was the highest beam score among the four teams. 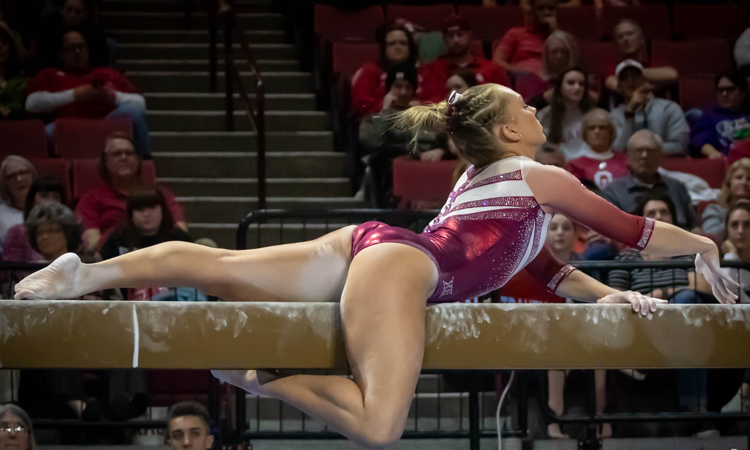 Implications: Maryland had a rough beam rotation, which held its final score back and put the team in seventh place in the Big Ten. Records: Cortland sophomore Emily Speciale set a career best 9.350 on bars. The Big Storyline: West Virginia bounced back from a rough bars rotation in Cancun, hitting all six routines and winning the meet by 0.750. Implications: Pittsburgh’s solid start puts it in first place in the EAGL conference. Records: Lots of program records and personal bests were set. Pittsburgh and Utah State both set program records for the highest score at an opening meet. Over 10 people set personal bests as well, including Pittsburgh’s Charli Spivey on floor with a 9.850 and West Virginia’s Abby Kaufman, Michelle Waldron and Jaquie Tun on vault with a 9.800, 9.775 and 9.900, respectively. Tun also set a career high on floor tallying a 9.900. From Utah State, Leighton Varnadore set a career high on both vault and in the all around with a 9.800 and a 38.925, respectively. Controversies: Scoring seemed to be all over the place at this meet with some routines scoring higher than expected while others were lower than expected. The Big Storyline: Look at those scores! These MAC teams proved they will not let Central Michigan run away with the conference. Western Michigan came close to the Chippewas’ total, and NIU’s near-194 is a big total. Implications: The top of the MAC is going to be very competitive this year. It will be an exciting ride, and both of these teams are in the mix!